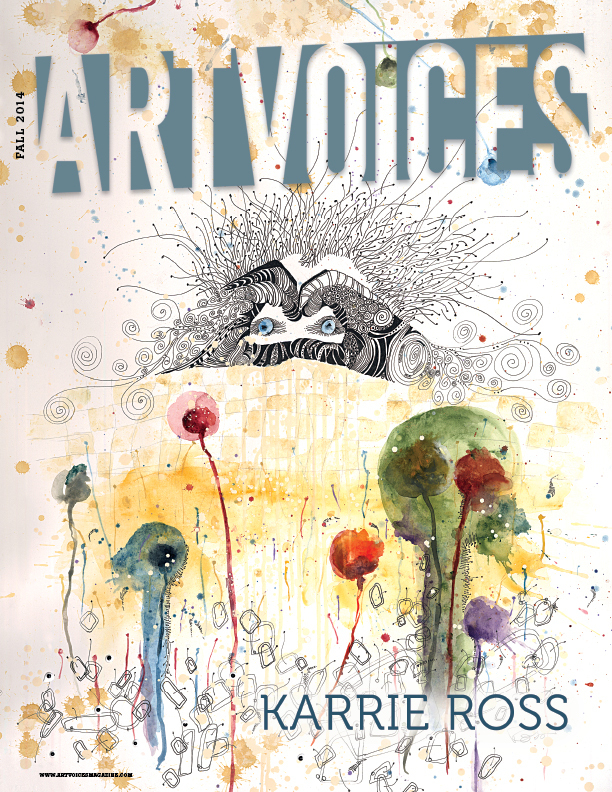 On the cover of Art Voices magazine their Fall Edition. Its a really nice magazine in that they like to promote the artists. It’s published four times a year. Their distribution is good and the owner is very nice. I had the pleasure to be interviewed by Jill Thayer when she came to my home. The interview can be read below and at this link at the magazine. 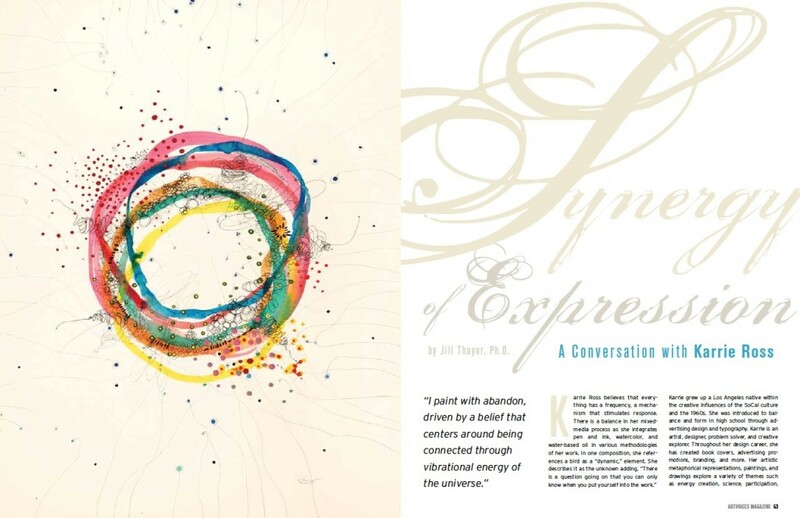 http://artvoicesmagazine.com/2014/09/synergy-of-expression/ I am happy that several of my pieces were included in the article. Mission: ARTVOICES wants to foster a comprehensive exchange of dialogue that supports our mission of free information exchange by providing an egalitarian and uncensored forum. We strive to serve as a manifestation of the voice of art, and all that it encompasses. Featuring: Blue chip, mid-career, and emerging artists, as well as museum directors, gallerists, curators, art world professionals, and collectors will be featured in ARTVOICES. ARTVOICES wants to foster a comprehensive exchange of dialogue that supports our mission of free information exchange by providing an egalitarian and uncensored forum. We strive to serve as a manifestation of the voice of art, and all that it encompasses. Karrie Ross: An underlying need to question and to keep busy, as both my parents were initial influences. My mother was a florist, who taught me the value of art-projects. My father, a carpenter/inventor, taught me to question. Their creative access filled my mind with a fascination for play and critical thinking. JT: Your art-project-book, Our Ever Changing World Through the Eyes of Artists: What are You Saving from Extinction? looks at 36 Los Angeles artists. What was your take away from this compilation? KR: Self-exploration and a better connection with the LA art community. I was looking for story—those “Aha” moments that happen in life. An interesting observation that showed up was that figurative artists wrote stories, whereas abstract artists wrote statements. And people like me who do surreal, non-real abstract work combined both! KR: Two marriages, my son, normal insecurities, mental/physical/emotional angst, a fascination with energy, and an art career. I am an award-winning artist and author, certified life coach, Feng Shui practitioner, and energy balancer. I change moment-by-moment. My life is an illusion that I create, especially when I acknowledge having lived a fascinating 65 years. My ‘what is’… IS right now. Change can be a simple ‘Aha’ moment when I see a shape and say, ‘That’s IT!’ Change is in the magic created within the mystery of living life. I change lives… mine and those around me. Welcome the paradigm shifts. JT: Authentic…it’s true depending on how it’s portrayed. KR: Yes, even though one person might think it’s authentic, another might think it’s contrived. And once again, [it’s] subjectivity. KR: My artwork balances symbols and figures to ignite a viewer’s attention. A context is formed from what my subconscious needs me to expose, so the art changes a perspective into a response. I have no idea what that is until the art is finished–balanced. I start with a symbol or figure, but all the rest ‘just happens’ when one is put next to another over and over again. KR: I attribute ‘pattern of play’ to my upbringing. Even though an activity was considered work, I was introduced to it in a way that I was playing while my parents worked. It’s very similar to meditation, Fourth Way, and concepts of Gurdjieff where the activity of doing something is not work. When we bring activity into play, the ‘precious now’ becomes magical in how it changes the vibration of our focus and being. KR: I like water-base mediums, ink, and paper collage. They seem more alive to me. I like the chemistry, the push and pull of flat to gloss, or metallic, and the kinetic properties of ink together create a wild and daring elegance. KR: I admire Twombly, Calder, Klee, and Miro. The constructivism of Duchamp and Man Ray fascinated me. I’ve been in several shows about symbols. Everybody can relate to a symbol— marks, letterform, and shapes can move a perception, bringing balance within to make a connection with our internal angst. This entry was posted in Fine Art Process, Notes: Karrie Ross on September 4, 2014 by Karrie.